Oil service coverage for over 40 car makes! 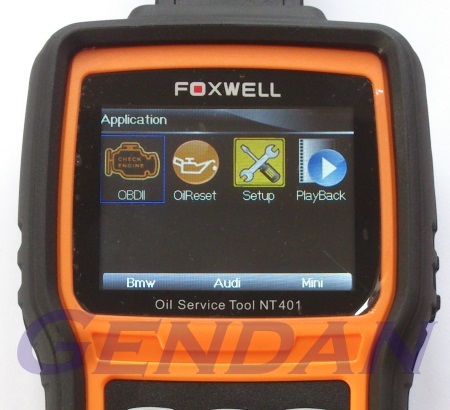 The Foxwell NT401 has been specifically designed to offer professional Service Light Reset coverage across a wide range of car manufacturers, at an affordable price - even for small garages and enthusiasts. On cars where the service light can be reset electronically, the tool will offer the option to do so. On cars where the service light needs to be reset through vehicle controls (typically dashboard buttons and the brake pedal), the tool offers step-by-step on-screen instructions. I recieved the NT401 oil service tool quickly and packaged well. Instructions for registration and update were clear, I had no issues with download of foxwell appp for updates and the device was updated via the memory card. I used this on a Fiat Qubo 1.3 td and picked up an air intake temp fault, which was as expected , so seams acurate. I was able to accsess sensor data and clear the code engine check light OFF . The device seams well made and robust, comes in a nice protective bag which holds cables and device. I am considering upgrading to the NT4021 pro in the future to give me more service options.